for there are many more. Thank you titi for the wonderful music and memories. for your wonderful additions on these tracks. 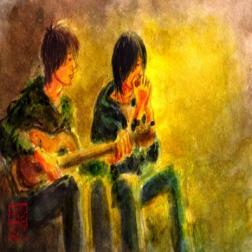 Album cover artwork by "koony". De la musique à mes oreilles ! When everything is there, is it real musique ! Proud to be your rythme guitare player ! A beautiful surprise. I know how to only say... I am a big admirer of Frank. This guy there is an incredible guitarist in the crystal clear and virtuoso play. I liked at once its first track and its quality. Endowed with a big sensibility and with a wide color palette, Frank little to play everything! And often hisits style is more Latin than me :D I humbly tried to accompany him respectfully during numerous tracks. In time, certain affinity are musical build up themselves beyond the distance, and it is the magic spark of wikiloops. Still one thank you to Frank, and to tell him that I am his first fan !